Let’s start with his BABiP, which is by no means a tell-all, but could be fairly useful. His batting average on balls in play (all stats as of today, August 27th) is .206. Among players with 350 plate appearances, that’s the worst mark by 19 points. The two players above Moose are Mark Reynolds and Chris Davis, each of whom strike out one every three or four at-bats. Which leads me to my second point. 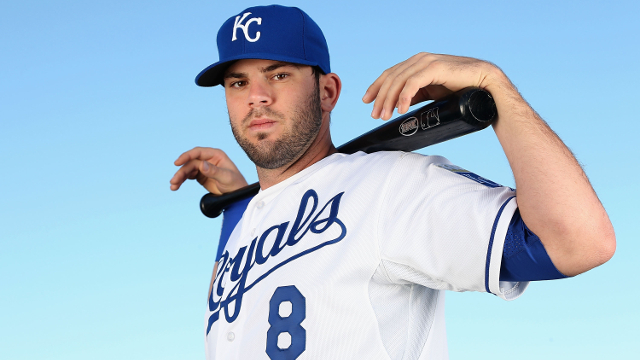 Moustakas’ strikeout rate is 15.1%, a number that has dropped two consecutive years now. His walk rate is 7.4%, still nothing to write home about, but that makes his BB/K% 0.49, on par with Alex Gordon, and better than Mike Trout (who has his own 2014 strikeout issues). Third point: his line drive rate, better than his two previous miserable campaigns, is at 19.3%, same as diminished Albert Pujols, and one-tenth of a point better than Lucas Duda. Duda’s HR/FB rate is a ton better than Moustakas, but – and I don’t think this is any small potatoes – Moose’s infield fly ball rate has also been dropping the last four years. It’s still terrible, but what a weird, eclectic leaderboard the IFFB% is (Mark Reynolds and Rajai Davis are at the top; Moustakas is right behind Omar Infante). Fourth point: Moose is posting a career-high 11% HR/FB rate. Still not great – Jose Abreu is at a staggering 30.3%, which Barry Bonds didn’t achieve from 2002 on (data not available for his crazy 2001)! – but a marked improvement on 2013. Fifth: His contact rate (83.7%) is pretty decent; his swinging strike rate (7.6%) is as well. When he swings, which over the last couple of years is increasingly at balls in the zone and not out of it, he makes contact. So. These last couple of items put together lead to one big note: Mike Moustakas is hitting the ball a lot harder this year than he ever has, despite sluggish production, and the results have been weighed down by bad luck. Should I go back through each game and look at the balls he’s hit? Sure! Of course! Will I? No. I’ll reduce this all to numbers because I don’t have time or access to MLB’s vault. But this put together points toward a bounceback year for Moustakas next season, and I’m willing – in my league, at least – to try to steal him from his current owner, who is undoubtedly sick of the stat line.